Oooh-ey, goo-ey, chewy and oh my gosh so delicious. 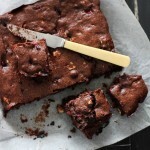 These Flourless Brownies, are now the winning entry into Australia’s Best Chocolate Raspberry Brownie recipe competition. 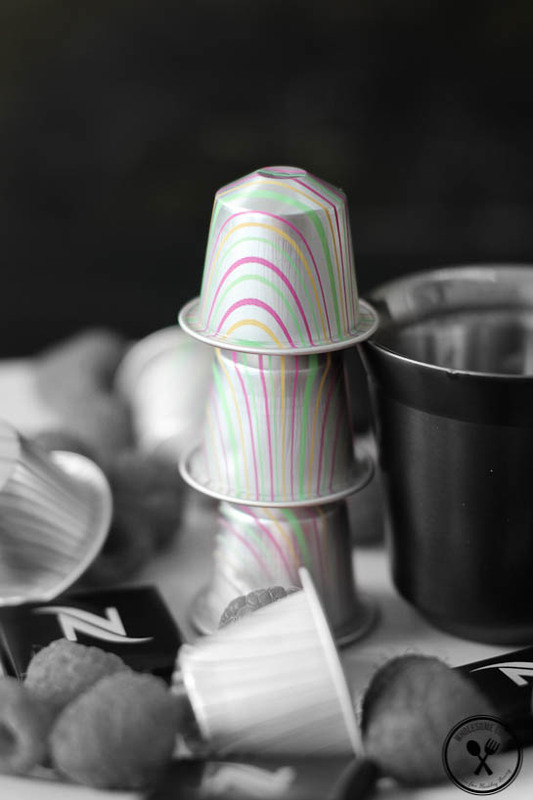 Inspired by the newly launched limited edition Nespresso Cioccorosso flavour variation, they dance to the notes of rich dark chocolate and fresh raspberries. Coffee aficionados will definitely like the unmistakable flavour and aroma of freshly ground coffee in this easy to make, gluten-free, coffee time treat. 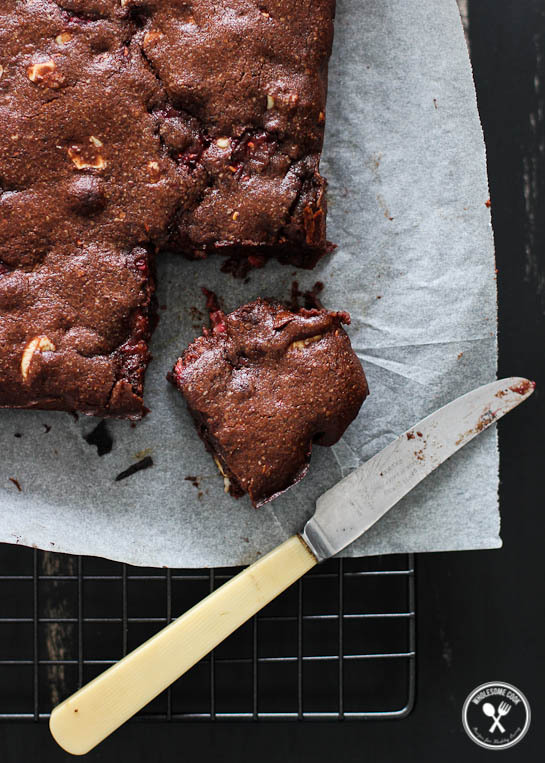 The search for Australia’s Best Chocolate Raspberry Brownie recipe is on and I’d decided to take a plunge and accept the invitation from Nespresso to join in the fun. 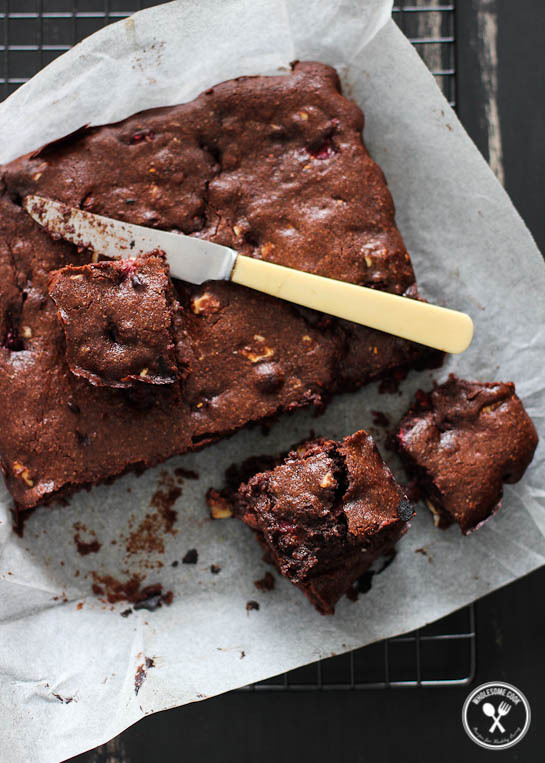 It was a bit of a last minute decision, but when I was asked late last week to put together a brownie recipe using chocolate and fresh raspberries – the notes encapsulated in their limited edition Cioccorosso coffee blend, I couldn’t resist for three simple reasons. They remind me of Indian summer days and my Grandfather’s simple cottage in the South of Poland. At the back of the small property was a treacherous at times, wild raspberry bush that produced the sweetest berries around. You could almost smell them as you entered the yard dotted with small veggie patches and fragrant flower planters. I didn’t mind the scratches nor the amount of effort it always took to get to the berries. The adventure definitely made them taste that much more delicious. And to this day they remind me of those warm summer days. Coffee is something I learnt to enjoy in my twenties. Coffee is an acquired taste, a very distinct one with bitter sweet earthy tones. My Mum took her coffee black with just a little sugar. I got my first Nespresso Krups coffee machine almost a decade ago. I’ve grown to like my coffee strong with just a dash of warm milk, but when it’s hot outside an espresso flat white with ice cold milk beats the heat for me. Coffee is part of my daily ritual and it helps – miraculously almost, to ward off migraines on those days when the weather suddenly changes. Yes, I am my own walking breathing weather change station. 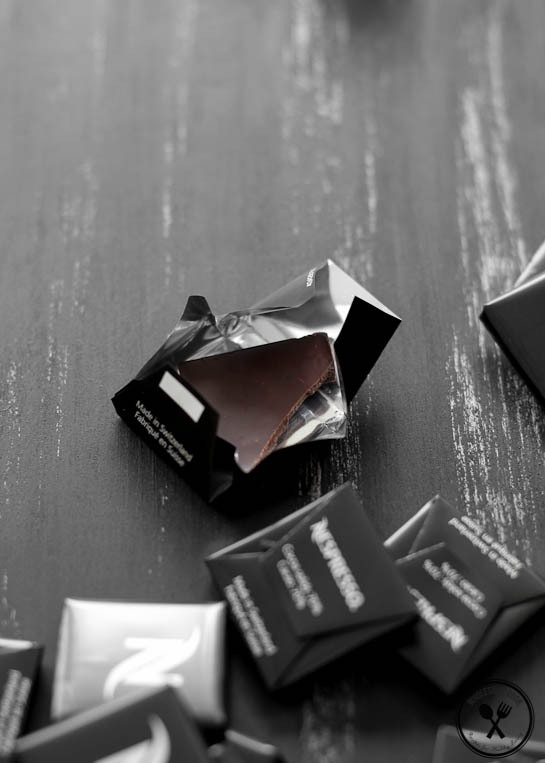 Chocolate tastes luxurious, is rich in magnesium and is a great de-stresser. Chocolate tastes good. Indulgent in fact, but it shouldn’t be a guilty pleasure especially if it’s at least 70% cocoa. Sometimes, when I am feeling a little stressed I crave chocolate – you can read more about food cravings here. Because chocolate contains magnesium it is a great stress reliever! It also contains other compounds that promote good mood. A spoonful of raw cacao blended into a cup of hot milk, or a couple of squares of dark chococlate enjoyed with your coffee can really make you feel happy. Making it flourless ensured that it is not only gluten-free, but also low in refined carbohydrates and free of bleached flour. I also made sure to use whole almond meal instead of blanched because there are a lot of nutrients in the skin – why throw them away? Those of you on low sugar diets may question my use of brown sugar in this recipe… It’s meant to be a little indulgent and truth be told, in total, the Brownie has exactly 10g of sugar per serving. That’s less than most muesli bars and other “healthy” snacks and most Chocolate Brownie recipes out there. Organic butter was a no brainer. For an Australian accent I used buttery macadamias in place of the more American walnuts or pecans. The result? Yep: oooh-ey, goo-ey, chewy and oh my gosh so delicious. Chocolatey rich. With notes of juicy raspberries and coffee. Nutty. One pot. One tin. Brownie! The recipe competition will run this week (November 11-18). Entries will be judged on the 18th of November by Simmone Logue and also based on readers’ comments, feedback from Nespresso Facebook page here and repins from the Nespresso Brownie Challenge Pinterest board. So please, share your thoughts. Apart from a cash prize, the winning blogger will receive the following to giveaway: a Nespresso U Milk Machine RRP $299 as well as a Glass Collection of Cups (RRP $50) and 5 sleeves of Cioccorosso (RRP approx $40). UPDATE: I Won! 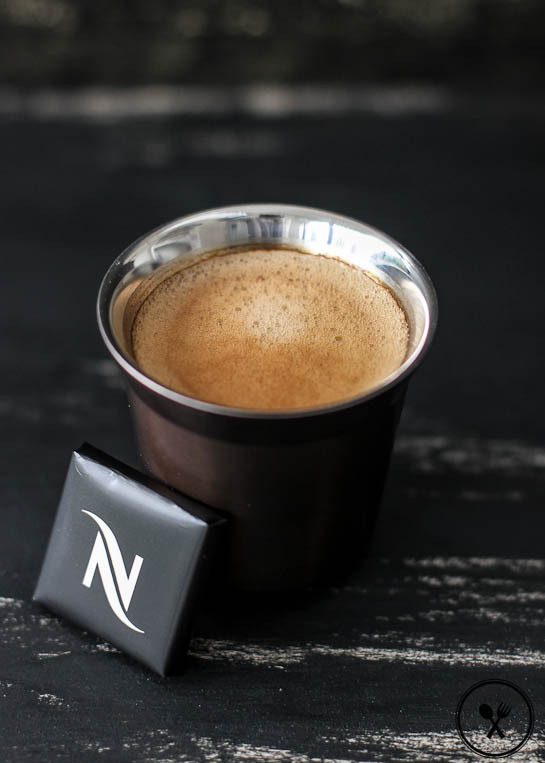 Stay tuned for the Nespresso goodies giveaway! And do check out the other entries here, they were pretty amazing too! I think these are PERFECT for making Coffee Chocolate and Raspberry Brownie Ice Cream like this… It’s a great way to prolong the life of your Brownies too, that of course, if there will be any left. 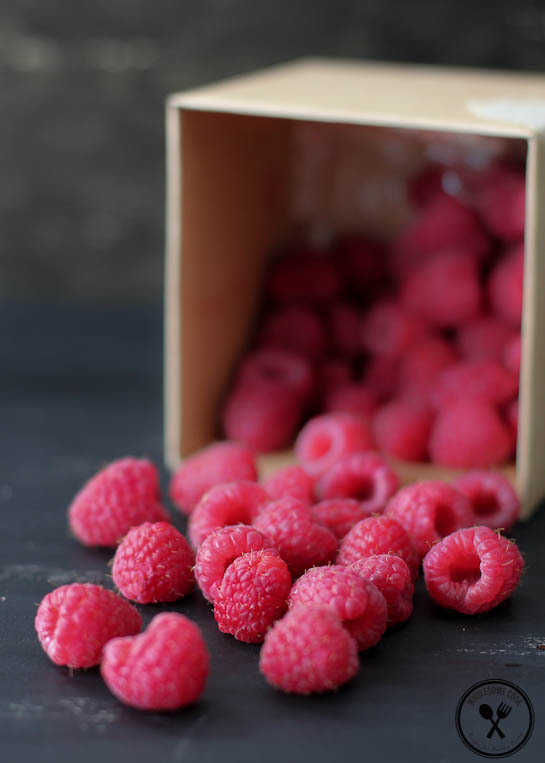 Ingredient notes: Frozen raspberries can be used, but make sure to thaw them out before mixing into the batter. I used Nespresso 70% cocoa chocolate for this recipe. I also used whole almond meal instead of blanched (continue reading for a nut-free suggestion). You can get it from most supermarkets nowadays. It is made with skin-on almonds because nutrients found in almond skins team up with the vitamin E present in their meat to more than double the antioxidant power delivered by either one of these nutrients separately. To make whole almond meal, pulse raw almonds with skin on using a food processor until desired consistency is achieved. Do not blend on high speed as you will end up getting almond butter. Following Denise's comment, I thought I'd add that for a treenut-free version you might be able to use a 1:1 ratio of ground raw sunflower seeds. I have not tested this, so comments are welcome. Preheat oven to 170C (150C fan forced, 325F, gas mark 3). Line a 20cm square tin with waxed baking paper. Place chocolate and butter in a medium-sized saucepan set over low heat for the chocolate and butter to melt, stirring occasionally. Remove the mixture from heat and add the sugar and coffee grounds, stir in well. Set the pan aside for around 10 minutes to allow the mixture to cool. Once cooled, using a whisk beat in the eggs until the mixture becomes smooth and glossy (it may appear curdled at first, just keep whisking). Whisk in almond meal. Add nuts and raspberries and fold in to combine. 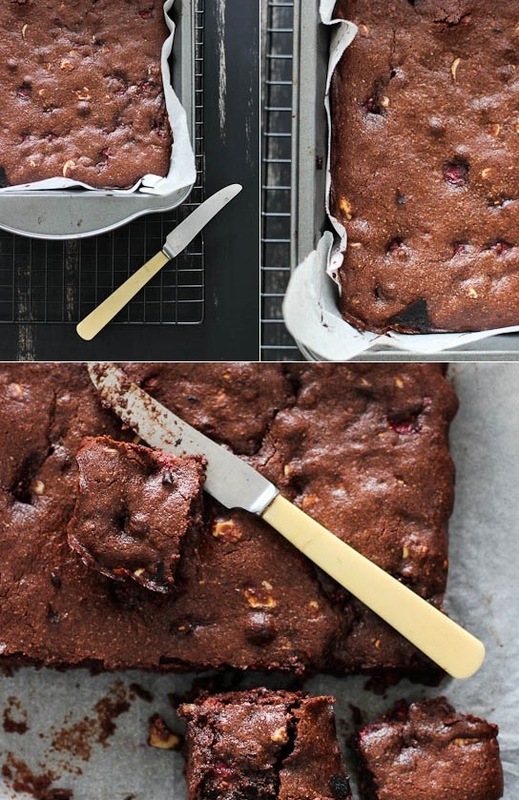 Using a spatula, scrape the batter into the paper-lined brownie tin and bake in the pre-heated oven for 30-35 minutes, or until the brownie is set on top and beginning to crack, but still soft to the touch in the middle. Remove from the oven and cool on a wire rack for 10 minutes, before removing from the tin to cool further. When cool, slice into 16 squares and enjoy with your favourite tea-time drink. Mash brownie in a bowl with a fork, Add ice cream and continue to mash and fold until the brownie is mixed in with the ice cream. Return to the freezer for 10 minutes to set. Scoop into a cone or a serving bowl. These Flourless Brownies, inspired by the newly launched limited edition Nespresso Cioccorosso flavour variation, dance to the notes of dark chocolate and fresh raspberries. Coffee aficionados will definitely like the unmistakable flavour and aroma of freshly ground coffee in this easy to make gluten-free coffee time treat. Hi Marty, that brownie sounds amazing and WOW it looks beautiful! Thanks also for the tips on coffee and chocolate as I get headaches too I will try your coffee tip next time. Yay! A healthy brownie recipe that includes good chocolate and coffee, love the ice cream suggestion too because commercially made brownie ice creams are always so fake. Hi Sharon, it’s great isn’t it. Enjoy! I love your recipes because they “healthify” traditional recipes and you make them so easy to make. This one is printing as we speak, perfect for Christmas me thinks with some cherries perhaps? Good luck, this deserves recognition. Oh my, the ice cream serving suggestion! So clever. I like my coffee with a little milk and prefer milk chocolate (bad for me I know) so the serving suggestion of this decadent dessert with vanilla ice cream is really appealing. I’m in love with the photos too. Thanks Jayne 🙂 I like the addition of fruit here too. And yes, always thinking of others. Wow!! Look at the top and edges of that brownie! I’ve never tried one with rasberries in it, so the better half will definitely be giving this one a go immediately. I just drooled a little reading this recipe! I cannot wait to try these out! They look so amazing!!!! Nom nom nom! 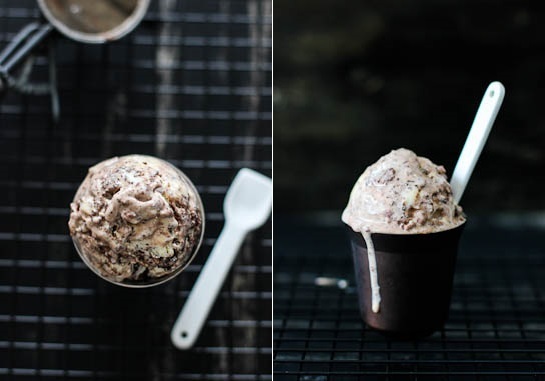 These look divine… and the icecream… yum! And the whole recipe is gorgeously photographed… definitely will try these. Wow, that will be the go to dessert for the next friend’s gathering. What’s not to like from those ingredients! Mmmmm, these look gooey and delicious – I want one NOW!!! Looks so delicious – and with the coffee too! Yum!! You are most welcome Jane! Sometimes the next best thing just won’t do. 🙂 Enjoy. What a wonderful recipe! Love that it’s flourless and you even make is sound heathly! Sounds easy and the addition of the new coffee flavour is exciting! Love fresh raspberries. Definately sounds like a winner!! My, oh my. I so want a piece of your brownies right now. It’s a perfect recipe for a long autumnal evening. I stumbled across the recipe through a friend’s facebook feed as was instantly hooked. I’m gluten intolerant so cakes are a rare indulgence for me. This is perfect and looks ummm… stunning. Thanks for sharing and keep up the good work. Your blog is fantastic. 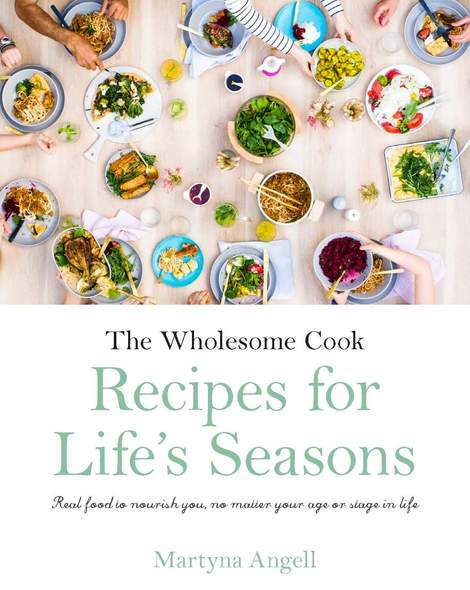 Wow, this looks great (I love the pics) and gluten free as well – thanks for thinking of us yet again. The recipe sounds amazing, love the whole food approach and your photos…. ummmm…. YUUUUM! Good luck in the competition. Stunning photos, chocolate, coffee, raspberries. Amazing allergy-friendly recipe. Is this coffee available in Australia only? Saw this recipe on the Kitchn and knew I had to come over an see it. Love your site and the recipe is very clear and full of good tips! Thanks, I’ve printed it to try. Love the fact that it’s gluten-free. My sister is allergic to gluten so I’m always looking for recipes that we can both enjoy and take to family gatherings. This is perfect for Christmas. 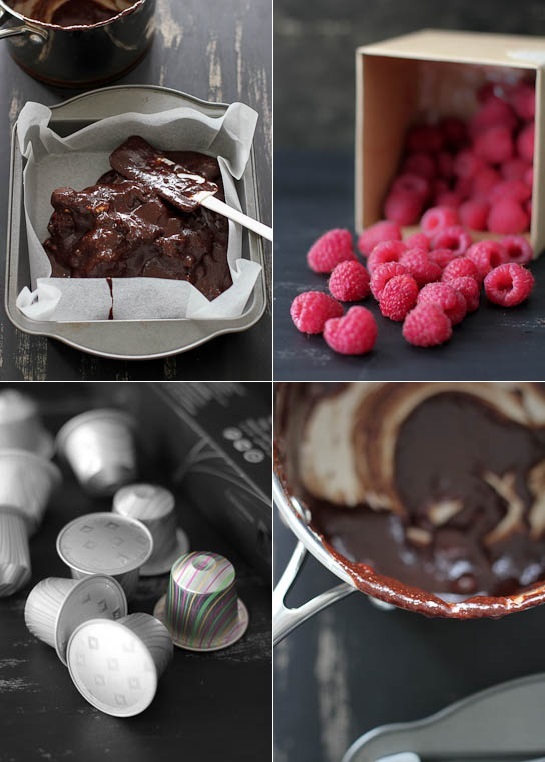 Coffee, chocolate, raspberries…. The perfect combination I say! Can’t wait to treat the taste buds to this amazing recipe!! This looks amazing 🙂 I’m about to make this brownie, but I can’t see the step where you add the almond meal… just with the eggs I’m assuming ?? Hi Izabella, yes – whisk in the meal after you’ve whisked in the eggs. Can I ask a stupid question – what do you mean coffee grounds? Do you empty the contents from unused capsules? Hi Kimberley, you got it! You empty the contents of the capsules into the batter for an intense coffee flavour. What a pity you have cut out the millions of nut allergy sufferers. Yet another treat we are excluded from:( it would be great to include an alternative for us. Hi Denise, I hadn’t tested the brownie with alternative flours. I suspect a gluten-free flour mix might work in some ratios, but there are other allergies and intolerances to consider with those. I have heard of substituting sunflower meal (yes, ground raw sunflower seeds) in a 1:1 ratio for almond meal. I have not tested this, but perhaps it might be worth a try. You’d obviously need to omit nuts from the recipe as well. I tried to make these as one of my colleagues is gluten intolerant. Unfortunately, they just didn’t hold together despite being in the oven for over 35 minutes. I’m not sure what went wrong. The almond meal didn’t seem to dissolve into the chocolate, butter, egg, coffee batter when I added it. Or maybe I should have left the fresh raspberries to dry out for longer after I had rinsed them – too much liquid. I’ll give it another go some time. Hi Sadif, I’m sorry to hear they didn’t turn out. I think you are right that the raspberries need to be drained well, perhaps pat them dry with a tea towel? Also, cooking for a further 5 minutes – every oven is different, and making sure that the brownie is cooled well may help with the cutting. I just wanted to say that your recipe is amazing. The first batch I made wasn’t cooked enough and was very fudge like but oh so delicious. I’ve since made plain ones with a little milk chocolate and cooked more and have turned into delicious chewy almost milo tasting treats. I’m now considering making a huge batch to give as Christmas gifts. Congratulations Martyna! I had a feeling this might be a winning recipe. It looks spectacular. Congratulations on a well deserved win! This is easily the most simple and yet oh-so-tasty brownie recipe I’ve baked. I was eager to try these but I didn’t have any raspberries at home so I stewed up some rhubarb and put dollops of that through before baking. Delish! I am going to try my next batch with plums. Frankly if the coffee is a fantastic blend then a simple biscotti is all you need! These are AMAZING! The coffee tastes wonderful with both the raspberries and the chocolate, the only problem was waiting for them to cool to eat them!